Flash Hard Drives (SSD) are they worth it? They found that the solid state drive did best the hard disk drive in _certain_ reading and writing tasks. Most notably, the SSD seek time was 0.9 ms. That’s under one millisecond. At the same time, random writes were 4x slower than the HDD. FlashSSD … doubled sequential and random uncached read and write speeds over the platter drive in most cases, topping out at about 52MBps read / 32MBps write. Samsung claims you’ll eke out 10-15% more system time on battery. Interestingly, BareFeats tested some SATA hard disk laptop drives and found speeds well over 60 MBps for both read AND write, connected via SATA and FW800. So the question for portable speed freaks (i.e. anyone doing multiple SD video feeds or HDTV) is– how badly do you need flash media? Do you need flash media to the tune of “about a grand” for 64gig versus about $122 for a Hitachi 100 gig HDD that offers higher read and right throughput rates. We have a feeling that until it’s 128GB, costs just a couple hundred dollars, and is available for purchase to end users as a part (instead of an upgrade in a new machine) most people won’t jump. I’ll also add that, until solid state media also offers read and write performance commensurate with the premium price, its only applications will be those harsh environments where a spinning platter just won’t work. In reality, those environments are few and far between. Remember,the data flight recorders used in jets, the boxes they recover after a crash… they use magnetic tape. As much as Sony and Panasonic will continue to tout how their flash storage systems work in the freezing cold, remember that in 1919, Frank Hurley documented an Antarctic expedition that went horribly awry and that footage survived the weather, and even dunking in the frigid oceans. When the Endurance sailed in October 1914, Hurley carried a range of cameras, including a Cinematograph motion-picture camera, a square bellows stand plate camera, a Kodak Folding Pocket Camera Model 3A, and a Vest Pocket Kodak camera… Hurley not only had the stamina to haul his cameras to the mountaintop of Duse Fell on South Georgia, but also was a talented artist and innovator. He was a pioneering practitioner of color photography with the Paget color process, and, when the long polar nights descended, he used multiple magnesium flares and long exposure times to capture images of the Endurance beset in darkness. After they abandoned the debilitated Endurance, Shackleton ordered the crew members to pare their personal possessions down to two pounds each. Hurley had to leave his precious cameras behind, but Shackleton allowed him to keep a selection of photographs and motion-picture footage. Stripped to the waist, Hurley dove into the icy waters to retrieve his treasured images from the sinking wreck of the ship. In 1919, his motion-picture footage of the Endurance expedition was released in the film In the Grip of the Polar Pack, which quickly became a critical and popular success. His photography also gained a wide audience when Shackleton featured it in his lecture tours. 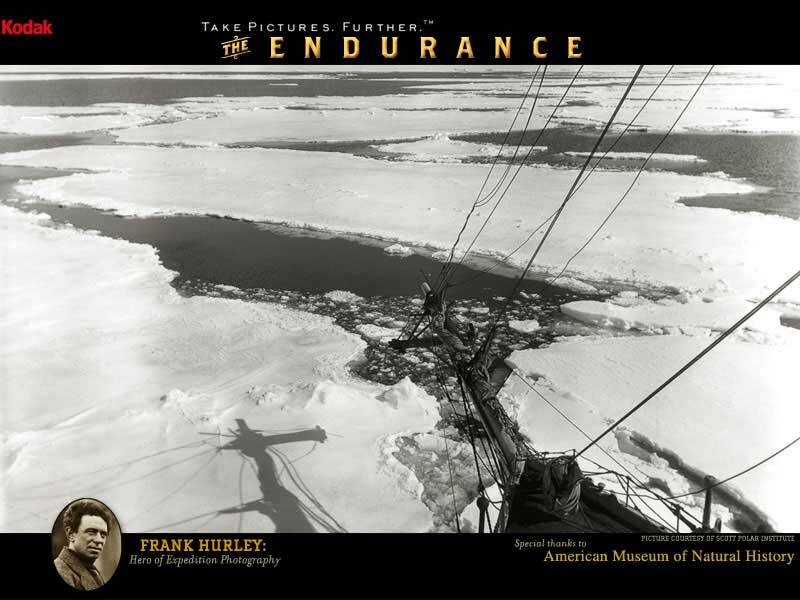 Hurley’s work from the Endurance expedition has been well preserved, and many of these images are seen in Shackleton’s Antarctic Adventure. South, featuring Hurley’s original 35mm cinematography of the Endurance expedition, was restored and re-released by the British Film Institute in 1998. So flash media ain’t got NOTHING on talent or courageousness. I leave you with one of his images. HD on a DVD. Toshiba joins Apple. Wither blue-ray? Besides cost, what are your objections to a flash drive? If Hurley shot today with a DSLR, he would use flash media, yes? Hurley is one of the greats that used ordinary equipment to produce extraordinary results- like the folding pocket camera. He went to great lengths (walking high up on the rigging) to give us viewpoints we would never have seen. He dove into icy waters to recover those images. He excellence is not about the latest technologies. Flash drives are currently incredibly expensive. Let’s say they weren’t. What do they offer that ordinary drives don’t? Massive space? No. Super fast read and write speeds? No. They do offer extreme ruggedness. The amount of applications that require that are extremely limited. Similarly, Sound Devices has tested the hard drives in their portable audio recorders by strapping them to vibration testing devices and found that they worked just fine. So what do you actually get in a SSD? But the page does note that impact resistance is a major issue. So if your problem isn’t vibration, then hard drives aren’t a problem, but if it’s shock, then they are a problem. I think the newest flight data recorders do use chips and not tape. I do know a small number of people in that and around that industry, so I’ll ask around. But I do agree with the point of the article, using SSDs as a computer hard drive doesn’t make sense except in incredibly specialized conditions. because they are faster on seektime, use less power and make no noise. just to name a few things why they are better. Are slightly quieter than the barely audible 2.5″ drives that are much cheaper and already available. In fact, there are numerous hard drive- based consumer camcorders. With the internal hard drive often less than an inch from the two internal microphones, those hard drives have proven to be inaudible. So what are the advantages again? Like any other technology, upon first release it is going to be fairly expensive, but as it becomes more mainstream, the cost to manufacture decreases allowing for cheaper retail cost. Also, because Hurley was known for using “average” equipment, you might be suprised… If digital had been available in his time, and it was considered as “average” as it is today, … maybe he’d have been using digital equipment. The fact that old people refuse to go digital, using every excuse possible doesn’t make digital bad… (Example : Saying – “It just doesn’t look as good.” Which I tested a few years back by puting a digital print and a print from a 35mm in front of a career photographer (and a good friend that is in his 60’s) who still won’t buy digital, and he couldn’t tell me which of the two was from 35mm without looking at the back of the stock…..) These are the same people that think we should go back to 33 and 45 records… Really???? C’mon!!!! For consumer camcorders, it makes perfect sense to use flash memory. Consumer camcorders are very compact, which means that even the smallest amount of noise from a hard drive or tape drive is picked up by the camera’s internal microphone. Not to mention ground loop issues, etc.. Flash based camcorders have no moving parts (except zoom/focus) which means no noise for the microphone to pick up. And now it is 2009 and SSD’s have gotten even better. However, the price per GB/s is still an issue and until the price lowers further I am spending my money on HDD. In most consumer based situations the ‘rugged’ and durability or SSD are useless and do not really offer much in practicality. Laptops it may be a different story, but the standard casual user finding a use in a computer case? Durability does come in handy if the user was to say, use the SSD as a portable Storage solution. One SSD I have inspected had a connection beside the SATA connectors in which you could use the standard USB cable that many Portable HDD use. You wouldn’t have to be worried about such problems as dropping it as much but then comes the loss, speed. I believe the speed of the drive would suffer through the transfer rate of the USB 2.0. Perhaps however if the drives were to incorporate USB 3.0 in the future then that would definitely make a difference. I think that in most cases these SSD drives are still not worth the cost for the results that they have shown but in the future they will be.